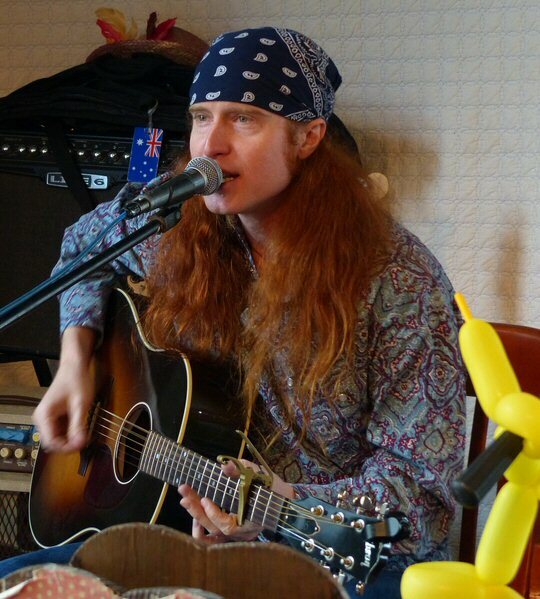 8 Ball Aitken is a gifted musical personality hailing from the land down under. The first thing most notice about him is his striking red hair until he picks up a guitar to begin laying down some of the funkiest swamp blues you’ll ever hear. 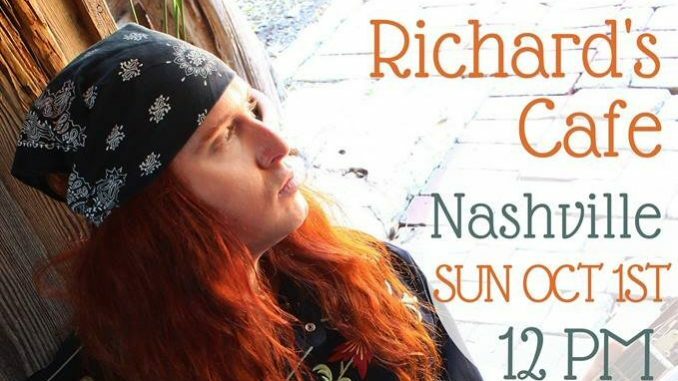 We caught up with the performer at his home away from home in Whites Creek, Tennessee when he played an afternoon set at the cozy confines of Ri’chard’s Café. An introspective 8 Ball Aitken on acoustic guitar at Ri’chard’s Café. Aitken took a few minutes to cue us in on his latest happenings. The active artist has built quite a following for himself in the past decade taking full advantage of a dual-citizenship to sink strong roots in Nashville and Austin. A family emergency in the form of the passing of his father dictated that he return to Australia in the last year but he used the tragedy to reconnect with his countrymen by touring the continent as much as possible. 8 Ball just finished up a quick trip back state side in order to lay down tracks for his next album in Texas. He also assured us that as soon as all the details associated with attending to his family’s needs are complete he will be returning to the U.S. in order to continue his impressive run on the table here one state at a time. In a live setting it’s easy to see to how Aitken has become a favorite in these parts. You can’t simply chalk up his success to his ample talent alone. He is a showman with a witty personality and he is his own one man-marketing machine. Throughout his three-hour set the Aussie was reminding patrons to purchase his T-shirts, bandannas, music CDs and vinyl offerings or even a personalized kazoo that was a featured instrument on a number of his songs. 8 Ball has appeared many times at Ri’chard’s Café. So much so that the employees were all wearing his gear while mouthing the words to his songs as he played them. Aitken had the crowd laughing as he told a number of jokes. He also utilized the multi-tasking café owner Ri’chard who joined in on harp and rhythm box throughout the show. Our favorite songs of the day included the sensitive “Girl In A Million” and the adventurous “Skydive” both from his most recent self-titled career-spanning release on Red Rocker Records. 8 Ball Aitken will spend the better part of the next three months racking up the miles in his homeland on what he’s calling the “Rack Em Up Tour”. Fans will get a chance to welcome him back as he brings his energetic and funky infectious blend of swampy blues-rock back to the Australian faithful. While he’s there he is sure to preview tracks from his upcoming 10th album Swamp Blues as he charts his course all the way through to the Tamworth Country Music Festival in January 2018. Ri’chard’s Café provided tasty takes on Cajun, Creole and American served in ample portions. They are open from Wednesday through Saturday nights with an additional Sunday Brunch. The restaurant regularly features live original music provided by Nashville’s premier up-and-coming artists and seasoned pros in a fun family atmosphere. We had the generous salads but we will be back for the fried mushrooms and pickles and a sandwich or two! 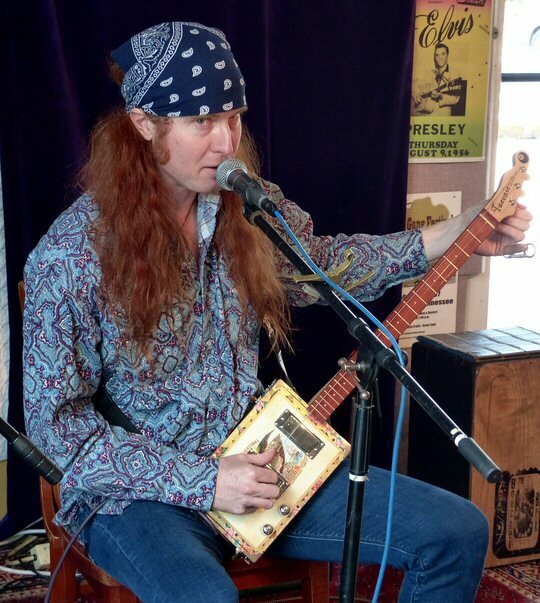 It got loud and swampy when 8 Ball pulled out the 3-string cigar box guitar.